Trevor Laurency is a fully qualified Fitness and Holistic Instructor with over 17 years experience. 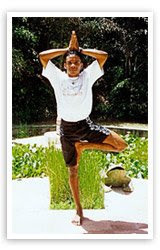 He taught at Le Sport Spa Hotel & Spa in St.Lucia for several years before moving to the UK where he is a freelance Instructor, specialising in the Holistic areas; Tai-Chi, Hatha Yoga, Yoga and Meditation, Yogatone, Yogalates (a combination of Yoga and Pilates) Ashtanga Yoga, Stress Management and Relaxation Therapy. For a few weeks every year, Trevor returns to Le Sport Hotel & Spa in St Lucia to run a Yoga Master Class, taking a group of his clients from the UK to St Lucia. His guests get the delights of Le Sport's unique body holiday concept whilst combining it with Yoga in the sunshine. Trevor Laurency met his yoga mentor, Sara Ivanhoe at Le Sport Hotel & Spa and then studied with her in 1993. Sara Ivanhoe uses her training in her work as Contributing Editor to "Shape," "Health" and "Fit Yoga" magazines. Sara is the instructor of the "Yoga for Dummies," "Crunch Yoga," and "Russell Simmons' Yoga to Live' DVD's. She is currently on Fit TV's "All Star Workouts." Trevor went on to study at the lyengar Yoga Institute in San Francisco, obtaining the Master Yoga Diploma; going on to Polestar Education in 2002 to obtain a Diploma to teach Yogalates. In the past few years Trevor has developed his knowledge further by studying with the British Wheel of Yoga where he qualified in 2003. In 2005 he went on to study with the BSY and qualified as a Professional Relaxation Therapist, and in February 2006 he became a registered yoga instructor of Independent Yoga Network in the UK. I have known this young, gifted and dedicated man all my life growing up in SLU with his late grandmother who he idolised. I've had a few of his classes both in SLU and in the UK - he is exceptional. Keep up the good work Trevor and my best wishes to you and family. Hope to join one of your classes while I'm in SLU.